Background: Marijuana is often smoked via a filterless cigarette and contains similar chemical makeup as smoked tobacco. There are few publications describing usage patterns and respiratory risks in older adults or in those with chronic obstructive pulmonary disease (COPD). Methods: A cross-sectional analysis of current and former tobacco smokers from the Subpopulations and Intermediate Outcome Measures in COPD Study (SPIROMICS) study assessed associations between marijuana use and pulmonary outcomes. Marijuana use was defined as never, former (use over 30 days ago), or current (use within 30 days). Respiratory health was assessed using quantitative high-resolution computed tomography (HRCT) scans, pulmonary function tests and questionnaire responses about respiratory symptoms. Results: Of the total2304 participants, 1130 (49%) never, 982 (43%) former, and 192 (8%) current marijuana users were included. Neither current nor former marijuana use was associated with increased odds of wheeze (odds ratio [OR] 0.87, OR 0.97), cough (OR 1.22; OR 0.93) or chronic bronchitis (OR 0.87; OR 1.00) when compared to never users. Current and former marijuana users had lower quantitative emphysema (P=0.004, P=0.03), higher percent predicted forced expiratory volume in 1 second (FEV1%) (P<0.001, P<0.001), and percent predicted forced vital capacity (FVC%) (p<0.001, P<0.001). Current marijuana users exhibited higher total tissue volume (P=0.003) while former users had higher air trapping (P<0.001) when compared to never marijuana users. Conclusions: Marijuana use was found to have little to no association with poor pulmonary health in older current and former tobacco smokers after adjusting for covariates. Higher forced expiratory volume in 1 second (FEV1) and forced vital capacity (FVC) was observed among current marijuana users. However, higher joint years was associated with more chronic bronchitis symptoms (e.g., wheeze), and this study cannot determine if long-term heavy marijuana smoking in the absence of tobacco smoking is associated with lung symptoms, airflow obstruction, or emphysema, particularly in those who have never smoked tobacco cigarettes. Marijuana is typically consumed by burning ground flower, top leaves or bud (marijuana) in a filter-less cigarette or joint with or without tobacco and inhaling its smoke.1 Marijuana has a similar chemical makeup, including toxins, as smoked tobacco, aside from approximately 60 cannabinoids in marijuana and nicotine in tobacco. Marijuana is typically smoked with larger inhaled volumes and much longer breath holding times than tobacco2 however, marijuana users generally smoke far fewer joints than tobacco smokers smoke cigarettes. The effects of smoking marijuana on lung health are controversial. In healthy individuals or those with asthma, a single episode of smoking a joint may lead to an acute bronchodilator response.3-5 Contradicting these results, other studies have reported a higher prevalence of wheezing, cough and sputum (bronchitis) in marijuana users6,7; unlike the clear association between tobacco cigarette smoking and COPD, epidemiological data have reported conflicting associations between marijuana use and lung function. For example, some epidemiologic studies have found that marijuana use is associated with a reduction in the ratio of forced expiratory volume at 1 second (FEV1) to forced vital capacity (FVC) suggestive of obstructive lung disease.8,9 Other studies have reported mild increases in FVC,10-12 thought to be due to the deep breathing maneuvers of users, thus potentially accounting for a reduced FEV1/FVC, independent of obstructive lung disease. There are significant challenges to assessing the role of marijuana on lung function, including the impact of co-existent tobacco smoking on respiratory outcomes. One population study looked at the role of marijuana use alone, or in combination with tobacco use, on lung function tests.6 Both marijuana and tobacco use alone were associated with a significant reduction in FEV1/FVC but when assessed for interaction between marijuana and tobacco smoking status they found the effect of marijuana use in those who also smoked tobacco was to reduce this effect by 0.8% (95% confidence interval [CI] -1.8% to 3.4%).6 Similar results were found with FEV1 and maximum midexpiratory flow (MMEF). Tan et al reported no association of marijuana alone with spirometricly-defined COPD in a random sample of Canadian adults >age 40, but they did observe a significant interaction between marijuana and tobacco.12 Other significant limitations to most previous research include bias on studying younger individuals (< 50 years of age) who are unlikely to show significant signs of lung disease even with significant tobacco exposure and few published studies have assessed emphysema by CT scan.6,13 To address some of these limitations we have investigated the relationship between self-reported marijuana use in the Subpopulations and Intermediate Outcomes in COPD Study (SPIROMICS) study. SPIROMICS (ClinicalTrials.gov Identifier: NCT01969344) is an ongoing multicenter prospective observational study funded by the National Institutes of Health (NIH)14 that enrolled 2982 individuals between November 2011 and January 2015. Individuals were recruited at university medical centers, and were 40-80 years old at the time of enrollment. The institutional review board at all sites approved the study protocol. Individuals (N=2982) were categorized as non-tobacco smokers (< 1 pack year; stratum 1) or smokers (> 20 pack years; stratum 2-4). Study participants provided written informed consent. Participants were enrolled into 4 strata based on tobacco smoking history, post-bronchodilator FEV1/FVC ratio, and other lung function criteria. The analyses reported here include participants (N = 2304) with >20 pack years who completed a short survey regarding marijuana use at the first visit. Never smoking controls (<1 tobacco pack year history) were recruited and enrolled based on normal spirometric function and represent a non-random comparison group for marijuana exposure. Marijuana users in this group were known to have normal lung function at enrollment. Because of this recruitment bias, never tobacco-smoking controls (N=157) were excluded from the analysis. Marijuana lifetime exposure and current use status were assessed at enrollment (online supplement Table 1). Marijuana use was categorized into current (use in the past 30 days), and former (use over 30 days ago) users and compared to never users. Those with a history of marijuana use estimated the number of bowls or joint equivalents smoked per week and how many years the participant had smoked marijuana (one bowl was equated to one joint in this analysis). This information was used to calculate the number of joint years which was kept as a continuous variable; 1 joint year is equivalent to smoking 1 joint or bowl per day for one year. A supplementary analysis was added to assess the impact of joint-year history with lung function and symptoms. Joint years were categorized into <10, 10-20, and >20 joint-year history and compared to those who reported zero joint years. Respiratory health questionnaires included: the modified Medical Research Council (mMRC) dyspnea score, the Short Form Health Survey--SF-36, and the St George’s Respiratory Questionnaire (SGRQ). Chronic bronchitis was defined as having 2 or more clinical criteria defined at their enrollment in the study. Acute exacerbations of respiratory disease were ascertained during the longitudinal follow-up (LFU) visit by asking “Since we last spoke, have you had an episode of increased cough and phlegm or shortness of breath, which lasted 48 hours or more?” If they answered yes, participants were further asked whether they received antibiotics or corticosteroids. Additional questions asked at each LFU contact included whether the participant urgently visited his/her doctor’s office, went to an emergency department, or was hospitalized. Participants were considered to have experienced an exacerbation if they answered yes to receiving either antibiotic and/or systemic corticosteroids. A severe exacerbation was a report of visiting an emergency department and/or hospitalization for an acute episode of respiratory disease. The total number of exacerbations was the total number of events for which a participant received antibiotics and/or systemic steroids irrespective of treatment location. The interval time between assessments was 3 months. CT scans at total lung capacity (TLC) and residual volume (RV) were acquired at enrollment and at a 1-year return visit.17 CT phenotyping was done using VIDA software on segmented lung images to measure lung volumes derived from imaging at TLC and RV. Metrics at TLC included mean lung attenuation, total lung tissue volume, and percent lung voxels falling below a threshold of -950 (emphysema). At RV, the percent voxels falling below 856 Hounsfield units (HU) (air trapping) were assessed. Cross-sectional analyses were conducted using R (version 3.3.1). Associations between respiratory symptoms and marijuana smoking status were examined using logistic regression adjusted for age, race, gender, FEV1%, current tobacco smoking status, pack years, and joint years. Pulmonary function testing variables and total tissue volume were kept as continuous variables and assessed with simple linear regression. Percent-predicted FEV1 and FVC were adjusted for gender, race, height2, age2, current tobacco smoking status, joint and pack years. All other pulmonary function variables were adjusted for height and age in addition to the covariates listed above. 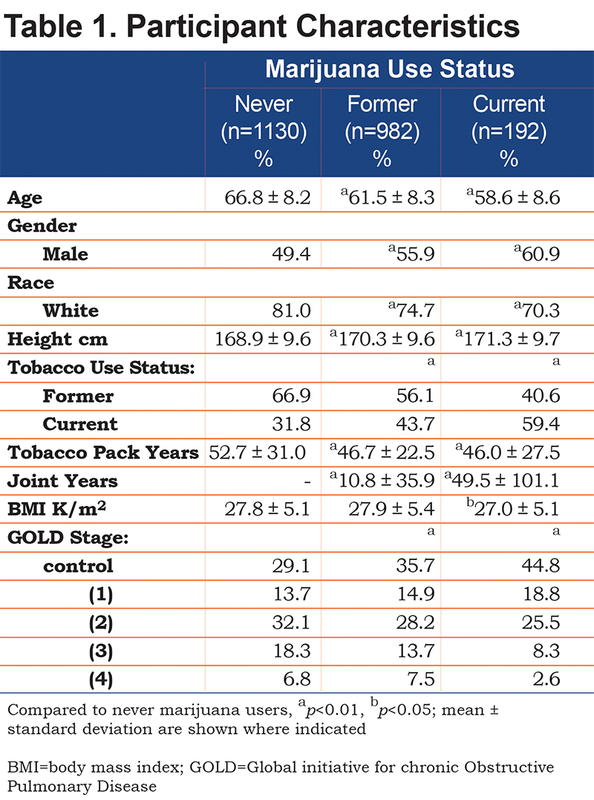 Additional analyses of the combined effect of current tobacco and marijuana use status on lung function were assessed for potential interactions and adjusted for age2, height2, joint, and pack years. Participants were further categorized as: current smokers of both tobacco and marijuana (TM), current smokers of marijuana and former tobacco smokers (MS), current smokers of tobacco and never marijuana smokers (TS), and never or former marijuana smokers and former tobacco smokers (NS). Emphysema severity was assessed with linear regression using stepwise selection; Akaike Information Criterion (AIC) is used to assign the most appropriate predictive covariates. Variables selected were age, gender, race, FEV1%, tobacco smoking status, joint years, pack years, and body mass index (BMI). Joint years were categorized into <10, 10-20, and >20 joint years and compared to those with zero joint years. Cross-sectional associations between respiratory symptoms and joint-year history were examined using logistic regression adjusted for age, race, gender, FEV1%, current tobacco smoking status, and pack years. Pulmonary function testing variables and total tissue volume were kept as continuous variables and assessed with simple linear regression. Percent-predicted FEV1 and FVC were adjusted for gender, race, height, height2, age, age2, current tobacco smoking status, and pack years. All other pulmonary function variables were adjusted for height and age in addition to the covariates listed above. Current marijuana use status was not adjusted for in these analyses to examine the effect of joint-year history as the primary explanatory variable. For comparability, emphysema and percent air trapping were assessed using the same covariates selected for percent emphysema in the previous analysis of marijuana use status. Those covariates include age, gender, race, FEV1%, tobacco smoking status, pack years, and BMI. In a total of 2304 participants, 1130 (49%) never, 982 (43%) former, and 192 (8%) current marijuana users are included. Participant characteristics are displayed in Table 1. Current marijuana users were more likely to be younger, white, and male than never users. They were also more likely to be current tobacco smokers and have less severe COPD. Joint years were significantly higher in current compared to former marijuana users, but there was a wide range in each group. BMI was significantly higher for former marijuana users when compared to never users. Further assessment of participant characteristics and joint years are included in the online supplement, Table 1b. Of the 2304 participants, 1610 (70%) had zero joint years, 388 (17%) had fewer than 10, 98 participants (4%) had 10-20, and 208 (9%) had greater than 20 joint years. Higher joint-year history was associated with younger age, being male, and white. Higher joint years was also associated with current tobacco smoking (as opposed to a former smoker), but lower tobacco pack years. 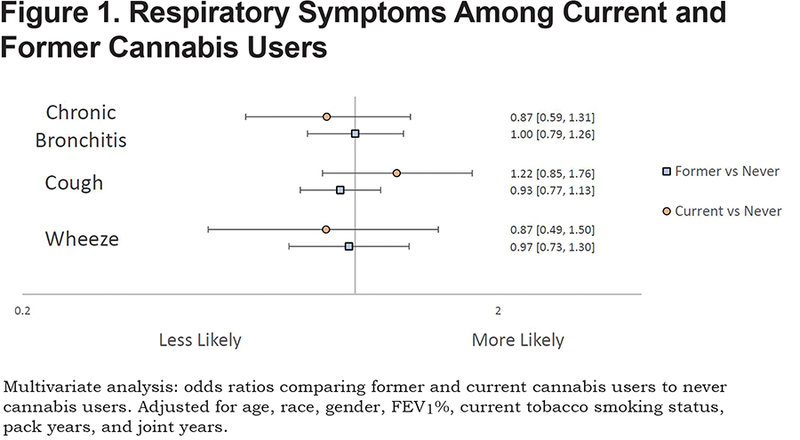 Neither current nor former marijuana use was associated with increased risk for cough, wheeze, or chronic bronchitis when compared to never marijuana users after adjusting for covariates (Figure 1). Cross-sectional analyses were performed to investigate associations of number of joint-year categories with respiratory symptoms (Online Supplement: Figure 1b). Those with either 10-20, or greater than 20 joint-year history were more likely to report wheeze (OR: 2.27, 1.09-5.39; RR: 1.66, 1.04-2.76) when compared to those with zero joint years. Chronic bronchitis was associated with those who had a greater than 20 joint-year history (OR:1.69, 1.19-2.39) when compared to those with zero joint years after adjustment for covariates. Current and former marijuana smokers had significantly higher FEV1 (P<0.001, P<0.001), FEV1% (P<0.001, P<0.001), FVC (P<0.001, P<0.001), and FVC% (p<0.001, P<0.001) when compared to never users, even after adjustment for other predictive variables (Table 2). Current marijuana use was associated with a significantly higher FEV1/FVC ratio (P<0.001) when compared to never users when adjusting for other predictive variables. Both current and former marijuana use was associated with significantly less quantitative emphysema (P=0.004 and P=0.03) and increased total tissue volume (P=0.003) compared to never users, even after adjusting for age, race, gender, FEV1%, current tobacco smoking status, pack years, and BMI (Figure 2). Former marijuana users showed higher percent air trapping (P<0.001) while current use was not significantly different (P=0.61) when compared to never marijuana users. Those with greater than 20 joint years had significantly higher FVC (p<0.01), FEV1 (P<0.05), and FVC% (p<0.01) when compared to those with zero joint years, even after adjustment for other predictive variables (online supplement: Table 2b). Those with 10-20 joint years had significantly higher FVC (P<0.01), and FVC% (P<0.05) when compared to those with zero joint years. A history of 0-10 joint years was associated with higher FVC (P<0.05), and FVC% (P<0.05) when compared to those with zero joint years. Percent air trapping was significantly higher among those with 0-10 (P<0.05) and 10-20 (P<0.01) joint years when compared to those with zero joint years. 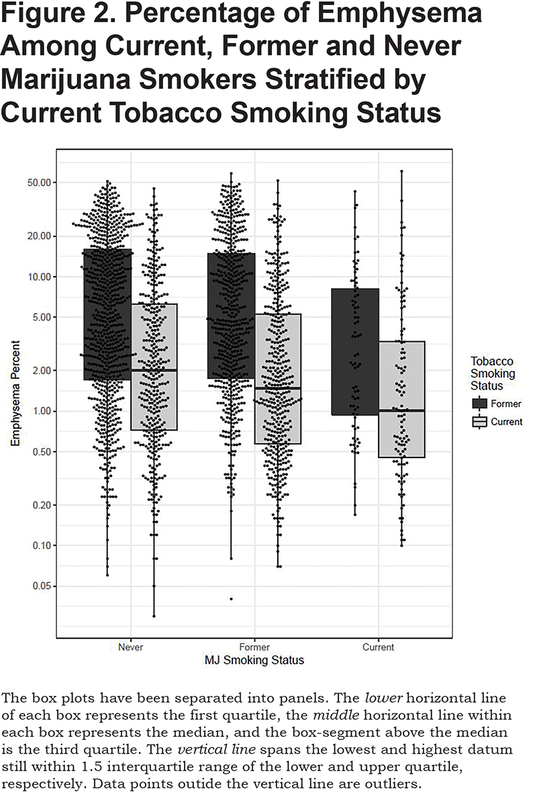 The effect of combined marijuana use with current tobacco smoking on lung function was further assessed by stratifying on current smoking status (Figure 3). After adjusting for covariates, both current tobacco alone and marijuana use alone resulted in a significant positive association with FEV1 (P<0.001, P<0.001), FEV1% (P<0.001, P<0.001), FVC (P=0.07, P<0.001), FVC% (P<0.001, P<0.001) and FEV1/FVC (P<0.001, P<0.001), respectively, when compared to those smoking neither tobacco nor marijuana. Combined use of marijuana and tobacco showed a significant positive association with FEV1 (P=0.02), FEV1% (P=0.02), FVC (P=0.04), and FVC% (P=0.04) when compared to those who did not currently use tobacco or marijuana. FEV1/FVC was not significantly different for combined current use of tobacco and marijuana (P=0.09) compared to non-current smokers of either substance at enrollment after adjustment for covariates. Although not all published studies are in agreement, one of the more consistent lung function findings in marijuana literature is a higher FVC.10-12,22 While the mechanism for this is not clear, it could include deeper breathing of marijuana users.2,23 If FEV1 is held constant, a higher FVC would be expected to be associated with a lower FEV1/FVC, which could result in classification as mild obstruction. Interaction between marijuana and tobacco shows conflicting results; while one study found a synergistic effect of marijuana and tobacco such that marijuana when smoked along with tobacco augmented the impact of tobacco on the prevalence of COPD,12 there is opposing evidence to suggest that the effect of marijuana is to reduce the effect of tobacco on adverse pulmonary function.6 In SPIROMICS, lung function among combined tobacco and marijuana users was lower compared to non-smokers of either substance after adjusting for covariates. These results should be interpreted with caution since in this population, adults who have quit smoking tobacco or marijuana likely did so because of poorer health. There are limitations to the interpretation of the results from this study. Mainly, this population is non-random and was recruited based on tobacco smoking history. Although we adjusted for tobacco use and excluded never tobacco smokers, it is still unclear if long-term heavy marijuana smoking results in significant risk of respiratory symptoms, lung obstruction, inflammation, or emphysema. The strong associations between tobacco smoking and adverse respiratory health may be masking effects of marijuana use. However, contemporaneous to the legalization of marijuana in many states, there has also been an exponential increase in the potency of tetrahydrocannabinol (THC) in marijuana from 3% to now 30% or more. Thus, marijuana smoke exposure should be expected to decrease as potency increases since users would need to smoke less to achieve the desired level of intoxication. Moreover, there may be fewer individuals who have heavy marijuana smoking exposure, unlike many tobacco smokers for whom it is not uncommon to smoke 40-60 cigarettes per day. Another limitation is that marijuana was an illegal, schedule 1 substance in most of the United States at the time our participants were recruited. This may have biased against honest disclosure of marijuana use. Additionally, marijuana exposure can be more difficult to quantify because of sharing, differences in dosing and inhalation techniques, and methods to consume or use marijuana (e.g., vaping, dabbing, edibles). These newer methods of exposure may not have been fully quantified in the SPIROMICS cohort; however, the advanced age of the cohort suggests that smoking was the predominant marijuana delivery method.18,19 The analyses presented here adjust for joint years. It is difficult to quantify joint years since one joint or bowl is not universally comparable. This may explain why joint years was not shown to be a predictive covariate in any of our statistical models of current marijuana use status and pulmonary outcomes. Finally, marijuana and its effect on lung function was not the primary aim of the SPIROMICS study and there were only 192 active users. Although these results were able to detect differences in lung function and phenotypes among marijuana use groups, these results are not generalizable to a healthy adult population. There may be no to little increased risk of marijuana use for a further increase in respiratory symptoms or adverse effects on lung function among those with a history of concomitant tobacco use. This cross-sectional analysis of participants enrolled into the SPIROMICs cohort was performed to investigate the relationships between marijuana use and pulmonary function and symptoms. Those enrolled were carefully screened and recruited based on tobacco use history and spirometric function and therefore, do not represent a random population of adults. Additionally, those included in this analysis reported >20 pack-year history of tobacco use. The relationships we found between tobacco use and pulmonary outcomes agree with a large body of research on the adverse pulmonary consequences of tobacco smoking (results not reported here). In contrast to tobacco smoking exposure, the illegality of marijuana use, up until recent years in select geographic areas, has made it a difficult target of epidemiologic observation. This study collected usage information on marijuana and reports on prevalence and associations of marijuana use among an older adult population with a history of heavy smoking, and lung health outcomes. Previously reported findings of marijuana and pulmonary symptoms have led to conflicting conclusions. Our results indicate increased FEV1 and FVC among current and former users of marijuana even after controlling for other predictive variables. 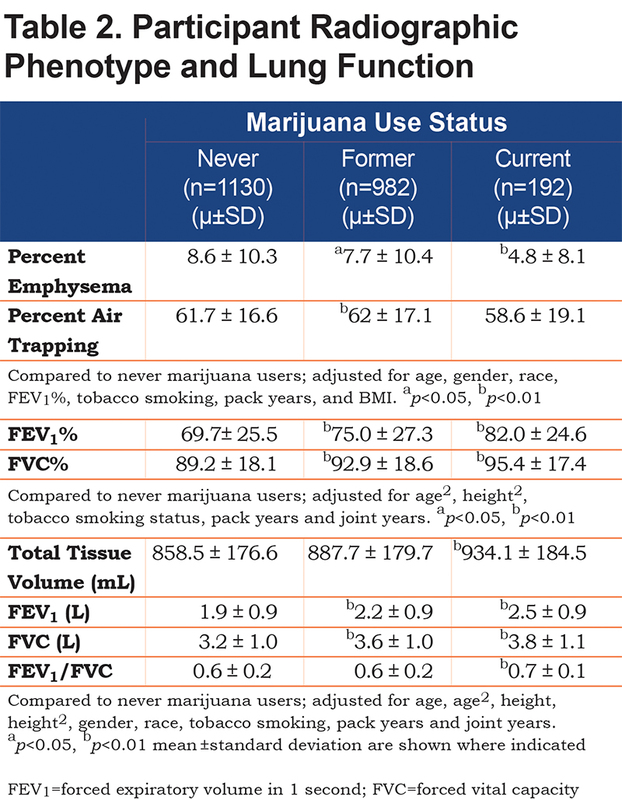 Evidence for a decreased ratio of FEV1/FVC with marijuana use has been supported 8,9,26,27 but could be due to an increased FVC.9,26,27 This study also revealed a lower percentage of emphysema, yet a higher total tissue volume among current and former marijuana users and a higher percentage of air trapping among former users after adjustment for covariates. Percentage of emphysema and total tissue volume are inversely related; increased inflammation could explain these associations in our population. Analyses of an interaction between marijuana and tobacco smoking revealed increases in FEV1 and FVC among those who used marijuana only, tobacco only, and both marijuana and tobacco. These results are likely heavily biased and should be interpreted with caution. Those who quit smoking tobacco likely did so because of poorer health; contrary to those who continued to smoke tobacco. Among older adults with a history of tobacco use, marijuana use does not appear to increase risk for adverse lung function. It is necessary to collect more epidemiologic data on marijuana exposure in a broader population to better understand its health consequences. The authors thank the SPIROMICS participants and participating physicians, investigators and staffs for making this research possible. We would like to acknowledge the following current and former investigators of the SPIROMICS sites and reading centers: Neil Alexis, PhD; Wayne Anderson, PhD; R. Graham Barr, MD, DrPH; Eugene Bleecker, MD; Richard C. Boucher, MD; Russell Bowler, MD, PhD; Stephanie Christenson, MD; Alejandro P. Comellas, MD; Christopher B. Cooper, MD, PhD; David Couper, PhD; Gerard Criner, MD; Ronald G. Crystal, MD; Jeffrey L. Curtis, MD; Claire Doerschuk, MD; Mark Dransfield, MD; Christine M. Freeman, PhD; MeiLan K. Han, MD, MS; Nadia N. Hansel, MD, MPH; Eric A. Hoffman, PhD; Robert J. Kaner, MD; Richard Kanner, MD; Eric Kleerup, MD; Jerry Krishnan, MD, PhD; Lisa LaVange, MA, PhD; Stephen C. Lazarus, MD; Fernando J. Martinez, MD, MS; Wanda O’Neal, PhD; Robert Paine, III, MD; Nirupama Putcha, MD, MHS; Steve Rennard, MD; Donald Tashkin, MD; Mary Beth Scholand, MD; Robert A. Wise, MD; and Prescott G. Woodruff, MD, MPH. The project officers from the Lung Division of the National Heart, Lung, and Blood Institute were Lisa Postow, PhD, and Thomas Croxton, PhD, MD. SPIROMICS was supported by contracts from the National Institutes of Health/National Heart, Lung, and Blood Institute (HHSN268200900013C, HHSN268200900014C, HHSN268200900015C, HHSN268200900016C, HHSN268200900017C, HHSN268200900018C HHSN268200900019C, HHSN268200900020C), which were supplemented by contributions made through the Foundation for the National Institutes of Health from AstraZeneca; Bellerophon Therapeutics; Boehringer- Ingelheim Pharmaceuticals, Inc; Chiesi Farmaceutici SpA; Forest Research Institute, Inc; GlaxoSmithKline; Grifols Therapeutics, Inc; Ikaria, Inc; Nycomed GmbH; Takeda Pharmaceutical Company; Novartis Pharmaceuticals Corporation; Regeneron Pharmaceuticals, Inc; and Sanofi. 4. Tashkin DP, Shapiro BJ, Frank IM. Acute effects of smoked marijuana and oral delta9-tetrahydrocannabinol on specific airway conductance in asthmatic subjects. Am Rev Respir Dis. 1974;109(4):420-428. 7. Tashkin DP, Coulson AH, Clark VA, et al. Respiratory symptoms and lung function in habitual heavy smokers of marijuana alone, smokers of marijuana and tobacco, smokers of tobacco alone, and nonsmokers. Am Rev Respir Dis. 1987;135(1):209-216.